I have been working on a few Christmas cards lately and fell in love with the Holiday Anya 2 stamp from The Greeting Farm. I love the bow around her dress. 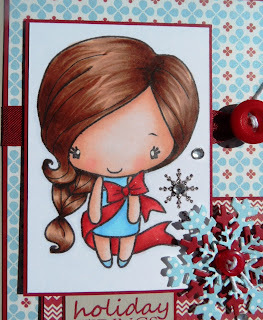 I teamed her up with some stunning paper from Lilybeedesign - Christmas Cheer 6x6 pad. Love all the bold patterns. Coloured her with Copic Sketch markers and used the great snowflake die from My Favourite Things Stamps. Close up of Holiday Anya - the photo does not show the sparkly bow as I went over it with a Clear Spica glitter pen. I have entered this card into the latest Garden Variety Challenge on The Greeting Farm Blog.